Finally, Apple has officially releases iOS 7.1 Firmware Final (Build: 11D167), (Build: 11D169b) version for iPhone, iPad and iPod Touch devices. If you're running an old iOS firmware version then it’s time to update/upgrade your current iOS firmware via iTunes or OTA automatically or via Manual files installation available below. You can Download iOS 7.1 Firmwares Final IPSW for iPhone 5S, iPhone 5C, iPhone 5, iPhone 4S, iPhone 4, iPod Touch 5G, iPad Air 5G, iPad 4G, iPad Mini, iPad Mini 2, iPad 3G, iPad 2G and Apple TV 3G/2G. The latest available iOS 7.1 Firmware Final Update (Build: 11D167), (Build: 11D169b) version contains improvements and bug fixes especially for Accessibility, Calendar, iTunes Radio, Siri, CarPlay, Camera, iCloud, FaceTime and other performance enhancement features. 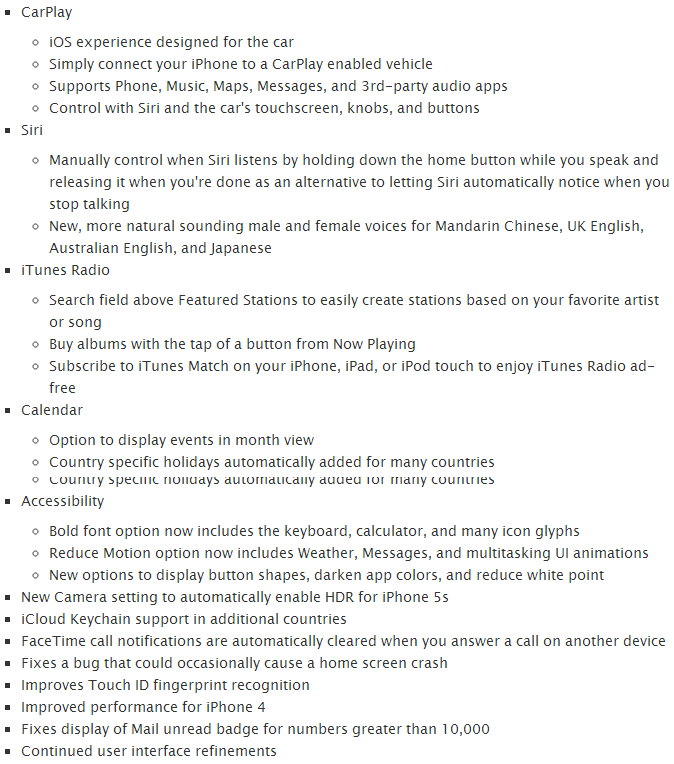 You can read full official change log and features of iOS 7.1 Final Firmware in below image. Apple iDevice users can download and install iOS 7.1 Firmware automatically via OTA (Over-the-Air) wireless process by simply heading-over to Settings > General > Software Update option. If you want to Manually Install iOS 7.1 Firmware via iTunes then below you will find the Official Direct Download Links of iOS 7.1 Final IPSW Firmwares for iPhone 5S, iPhone 5C, iPhone 5, iPhone 4S, iPhone 4, iPod Touch 5G, iPad Air 5G, iPad 4G, iPad Mini, iPad Mini 2, iPad 3G, iPad 2G and Apple TV 3G/2G. It’s a tradition of Apple, that soon after the final release of any iOS firmware version they start production and work on a next version, so user needs to get ready for next available iOS firmware version i.e. 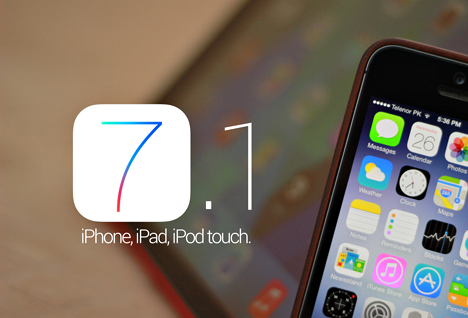 iOS 7.2 or iOS 7.2 Beta firmwares. Team 'Evad3rs' has already started to work on Untethered Evasi0n7 Jailbreak for iOS 7.1 Final Firmware, but currently no official Jailbreak is available for iOS 7.1 Firmware.